It was Silva Migirdeyan’s first visit to FAR’s Vanadzor Old Age Home (VOAH), a retirement community for 55 low-income seniors. A great supporter of VOAH, Silva was used to getting updates about VOAH’s tatiks and papiks (grandmas and grandpas) via photos and second-hand stories from her cousin Sahan Arzruni, VOAH’s long-time advocate and donor. This was the first time she was finally able to see the project with her own eyes. The New Jersey resident joined other FAR donors and staff members from other local organizations for an excursion to VOAH during her recent trip to Armenia in late September, which was organized by FAR. There, she was able to learn about the everyday routine of the residents. Mrs. Silva also spent time talking with everyone and listening to their stories. “It was nice to see them in their clean and tidy rooms. They are very nice and I’m happy VOAH has become a family for these great people. They have nothing to worry about; they have a place to live, food, and every opportunity to socialize,” she said. 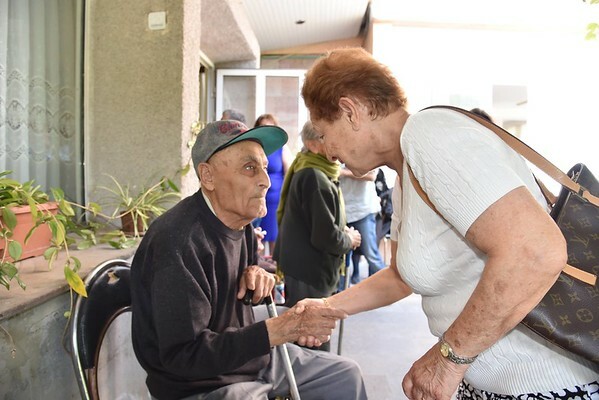 VOAH provides its beneficiaries with nutritious and balanced food on a daily basis, access to basic healthcare, and participation in cultural events to make sure the elderly residents live their lives in dignity. VOAH is sponsored by the Kevork and Sirvart Karamanuk Foundation and is supported by the Women’s Guild Central Council of the Diocese of the Armenian Church of America. It operates in cooperation with Armenia’s government.